According to the American Academy of Pediatric Dentists (AAPD), parents should book dental appointments with a pediatric dentist for their children at least twice yearly, starting about six months, following the eruption of the first tooth. These two yearly dental appointments enable the pediatric dentist to watch the teeth development closely, examine any change in the state of the gums and teeth and continue to guide the parent or guardian on how to care for the baby’s oral health. The pediatric dentist may recommend extra appointments for children who are prone to tooth decay or exhibit early symptoms of orthodontic issues. The primary purpose of having a pediatric dentist to ensure the child has a familiar dental home. In cases of dental emergencies, parents can easily take the child to the usual dentist for treatment. Also, the pediatric dentist stores a detailed record of the child’s dental health and jaw formation. Usually, unless there is an injury or trauma, dental conditions do not begin overnight. If the pediatric dentist knows the history of the child’s oral health, it will be easier to prepare for potential issues and treat them before they occur. 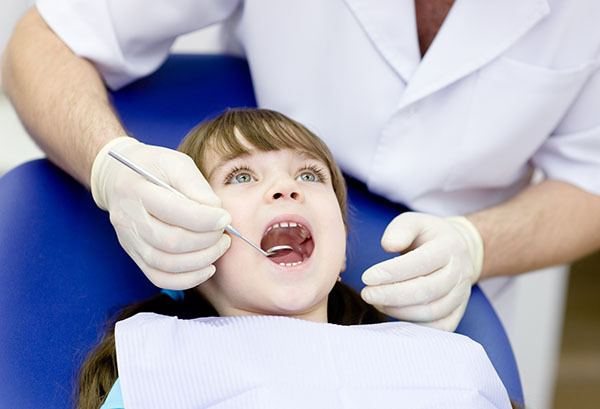 The pediatric dentist is qualified to guide the parent on maintaining oral care. Sometimes, the parent may be introduced to dental procedures such as sealants, xylitol or fluoride supplements to protect the baby’s teeth. In some cases, the pediatric dentist may suggest a change in the child’s dental or dietary behavior — for instance, limiting the amount of sugar or changing the child’s sippy cups to adult drinking glasses. Finally, dental X-rays may be the only means to detect small cavities in baby teeth. Although the child may feel no discomfort, failure to treat the cavity may worsen the situation into tooth decay, large cavities or even periodontal disease. Dental X-rays are only performed if the dentist thinks cavities or orthodontic irregularity may be inherent. Is a checkup important if the child’s teeth are healthy? The state of a child’s teeth can change quickly. Even if you recently had a dental appointment, changing diet or oral routines can make the child susceptible to dental decay or misalignment. Aside from the usual visual examination, the pediatric dentist will clean the child’s teeth thoroughly during your appointment. This deep cleaning will eliminate plaque and debris that may accumulate between the teeth and other inaccessible areas. Although you should maintain proper dental care routine, the expert cleaning will keep the teeth healthier. The dental professional will also watch the child’s fluoride level during the checkup. Usually, a fluoride gel or varnish will be used on the teeth after deep cleaning. The fluoride mineralizes the teeth and minimizes mineral losses to shield the tooth enamel from acid penetration. If your community water supply is not fluoridated, the dentist will provide fluoride supplements. If possible, your child may get dental sealant, an impenetrable plastic shield that protects the molars from decay-causing bacteria and acid. It is important that you do not miss your regular dental appointments with a pediatric dentist. It is vital for your child’s dental health.